The longstanding championship battle between Patrick Fletcher and James Bark hotted up further at Silverstone for rounds 11 and 12 of the K-Tec Racing Clio 182 Championship, where Bark took a duo of victories to close the points margin to just four between the pair, once drop scores are taken into account. An incident-filled opening lap of race one caused a red flag, where Trevor Gregory was turned into the pit wall off of the start and was collected by his Father, Bill. Further around the lap Arron Sharp was turned around and collected by Martin Ward, eliminating Sharp. To top of the melee, Arron’s brother Scott had already been taken out of the race as his bonnet accidentally flew open on the green flag lap, smashing the windscreen. An eight minute plus one lap restart followed with Bark, Fletcher and Phil Wright at the head of the pack – an occurrence which has been fairly regular this season. They finished in that order despite some challenges from Fletcher. A strong run from Don De Graaff saw the former Formula Renault racer take fourth, from 13th on the grid. Nick Garner and George Williams completed the top six, with the latter driver running fourth in the early stages. Former kart racer Charlie Turner took seventh in his first car race, aboard the Andrew Tibbs-run Clio. Bark took another lights-to-flag victory in race two. Wright got the better of Fletcher at the start, but the positions switched on lap four which meant an identical podium to Saturday’s encounter. Mark Balmer took an impressive fourth, ahead of Garner and Scott Sharp. The final outing for the 2016 K-Tec Racing Clio 182 Championship is at Rockingham on 11th September, where the championship will finally be decided. As the 2016 K-Tec Racing Clio 182 Championship moved into the second half of the season, it was still all to play for upfront, where 2015 runner-up Patrick Fletcher had managed to find a slim points lead over reigning champion James Bark in what was otherwise a perfectly alternated string of victories. Things didn’t change at Anglesey, where it was Fletcher who grasped pole position by 0.11 seconds from Bark, and narrowly ahead of Phil Wright and George Williams. The first race went the way of Lincolnshire-based Bark, however Fletcher had made the most of a good start to hold the lead in the opening two laps, with Bark and Williams tussling behind. The latter driver however lost out in the battle and dropped to ninth, before Bark moved through to take the lead. It was Mark Balmer who occupied the final podium spot by the close of the shortened race, coming through from seventh on the grid to finish ahead of Wright, Williams and Trevor Gregory. Arron Sharp had been running well up in sixth place, yet a spin at Rocket dropped him to the back of the pack. The second outing was marred by a coming together between Williams and Balmer after a brake issue for the former driver, however Fletcher held on to take his turn on the top step after getting ahead of rival Bark on the second lap. This time it was former stock hatch frontrunner Scott Sharp who finished third ahead of Gregory and Wright, with Balmer recovering to ninth despite damage. That single extra victory for Fletcher means that he leads the championship going in to rounds 12 and 13 (at Silverstone on 20/21 August) by 38 points before drop scores are taken into account, where the pair’s battle is unlikely to show any sign of slowing. The fourth meeting of the 2016 K-Tec Racing Clio 182 Championship was affected by rain with a sodden track on Saturday and light drizzle on Sunday catching drivers out. A very slow start for pole man Patrick Fletcher dropped him to sixth before he’d even entered the first corner. That allowed championship rival James Bark to head the field, although he was hit by a late-braking George Williams. Bark held a big slide and continued to lead. Williams continued to have an eventful race with some slides and a spin at Coram before finishing fifth. Bark held off a charging Phil Wright to win. The recovering Fletcher came third, just a couple of seconds behind the winner. Andrew Tibbs grabbed fourth with Williams and Nick Garner behind. Garner passed Scott Sharp on lap two, the latter fell down the field to 12th after being muscled off the circuit at Oggies. Fletcher and Bark were well clear of anybody else in race two after Wright retired with an engine issue. The pair ran nose-to-tail for the majority. With drizzle falling for the last couple of laps both ran wide thanks to slides but Fletcher held on – giving the two main championship rivals a win a piece in Norfolk. A crazy battle occurred behind. Williams was the first victim as he went off the track at Hamilton into retirement. Don De Graaff duly moved from sixth to third with Scott Sharp chasing. Sharp lost out to Nick Passmore at Brundle on lap three with Passmore making a great move around the outside. Sharp didn’t fancy staying fifth for long so reversed the positions at Montreal on the following lap. Both were quickly made aware of Tibbs – who had started 11th. By the end of the sixth lap he had passed them both. He challenged De Graaff into Riches but the ever greasier surface caught him out. The pair made contact with a pair of retirements being the unfortunate consequence. Sharp came through to claim his first Clio podium with Trevor Gregory chasing him to the flag. Passmore had dropped back, which helped to gift Nick Garner and Martin Ward a top six finish. Simon Donoghue was also involved in the battle for third and claimed a career best finish of seventh. The next outing for the 2016 K-Tec Racing Clio 182 Championship is at Anglesey on 16th/17th July 2016. Patrick Fletcher went one better that last year at Croft in the K-Tec Racing Clio 182 Championship, coming away from the North East not with only both pole positions and race wins, but also a subsequent commanding lead in the championship points. The 2015 runner up initially lost out to reigning champion James Bark following the first race getaway, but by the end of lap one it was Fletcher from Bark, with Phil Wright in third. Wright made his move on Bark at Tower on the second lap to produce a podium order that was to stay until the race end, and the final two positions in the equally-spaced five car train were reversed on lap four when Mark Balmer overtook George Williams. It was Fletcher from Wright once again in the second outing, but this time Mark Balmer took advantage of an absent post-lap one Bark to take his first podium in third place. Wright tried his utmost to make a move on Fletcher at Tower but couldn’t make it stick, and former Stock Hatch front runner Scott Sharp was best of the rest to claim fourth position. As a strong grid of Clios took to the track for the first time this year at Donington Park, it would have been natural to expect that 2015 title contender Patrick Fletcher and eventual champion James Bark would be ones to watch. Yet with the top ten places in qualifying separated by less than a second around the National Circuit, the opening meeting kicked off what looks to be a season that’s closer than ever in the K-Tec Racing Clio 182 Championship. Bark started race one on pole but Fletcher lining up alongside Robert Armitage on row four, with last year’s tied pair now separated by George Williams, Philip Wright, Mark Balmer, Don De Graaff and Pete Morgan. As the flag dropped for race one however it was the 2015 championship’s 10th placed man Martin Ward who made the most of the sprint to turn one, finding his way up to fifth at Redgate from tenth on the grid. Bark took control of the race but only as the frontrunner of a tightly-knitted pack, initially holding off Williams until lap five when Wright reversed their positions for second and third places. By this point Ward had dropped to seventh and Fletcher had made his way through to tag onto the back of the leading pack, setting the fastest lap along the way. A good battle was hotting up through the mid-race distance between the number 14 car of Trevor Gregory and former stock hatch frontrunner Scott Sharp, with the pair going side by side in the drop down through Craner Curves. Various positions looked in jeopardy after fluids were laid down on lap nine, yet at the flag the race duly went the way of Bark to start his 2016 campaign, with Wright in second place and Fletcher getting the better of Williams on the last lap to close in and take third. De Graaff placed fifth with Gregory sixth. The first few grid slots were occupied by much the same cars in the second outing of the day, where the top eight remained close but ordered until lap four, with an order of Bark from Williams and newly promoted Fletcher, then Wright, De Graaff and Ward. It wasn’t long though until the Bark and Fletcher rivalry was going wheel-to-wheel, with the pair side by side through Coppice but also sharing their space with the now-omnipresent Wright and De Graaff. Bark dropped to fifth initially but soon fought back, taking third at Redgate and by the penultimate lap he’d managed to come out at the head of the battle. The defensive driving from the trio however left enough breathing space for Fletcher to notch up some consistent pace; sufficient to pull a lead that would prove impossible for Bark to rein in before the end without any mistakes or traffic. As the flag came out for lap 11, the race duly went the way of Fletcher, from fastest lap-setting Bark and DeGraaf, then Wright, Williams and Ward close behind. In a reverse to race one results, Scott Sharp just had the better of brother and Club newcomer Arron for ninth and tenth places, and there was little to separate Richard Thirbin and Terry Roughton across the line for 11th and 12th. The K‐Tec Racing Clio 182s bought a strong 27 car field to North Yorkshire for rounds 3 & 4 of the championship, after a busy 15 minute practice session held in bright sunshine, the top 10 were covered by less than 2 seconds with Patrick Fletcher taking pole position by half a second from Andrew Tibbs. Former TOCA package star (in Ginetta Juniors and Clio 197s) Aaron Williamson was next up in a one off outing whilst George Williams took a career best fourth. In race one, Fletcher was in dominant form taking a comfortable lights‐to‐flag victory after making an early break from the squabbling pack. After losing out at the start Andrew Tibbs snatched second on lap five and was able to hold off series newcomer Williamson for the rest of the race. Matt Digby, the ever consistent Phillip Wright and Andrew Harding completed the top 6. George Williams lost out after an early race incident eventually finishing well down in the pack. Original content from 750 Motor Club. Brands Hatch hosted the second 750 Motor Club meeting of the year and the paddock was full to bursting with eager competitors. All 11 categories racing over the course of the weekend boasted a healthy grid with three formulas needing to race in groups due to being over Brands’ grid capacity. The K-Tec Racing Clio 182 Series became a championship for the first time in 2015, and of the 34 cars that came to Kent, 20 were separated by a mighty impressive 1.75 seconds in qualifying. Pole man Matt Digby led the early stages of the opening encounter but fellow ex-Stock Hatchers Patrick Fletcher and Andrew Tibbs (in his first Clio race) dived through with a great move at Paddock Hill Bend on the sixth lap. Fletcher broke away through traffic to take the victory with Tibbs and Digby chasing. James Bark, moving over from Golfs, took fourth after a race long scrap with Jeff Humphries. Round two was greeted with damp conditions and a very slippery circuit. Fletcher, starting from pole this time, couldn’t find any grip off the line and fell immediately to fifth with Digby heading Humphries at the front. Bark was a man on a mission though and was quickest to get to grips with the conditions perfectly. He passed Humphries on the second lap and chased down Digby. The leader controlled a big slide at half-distance at Clearways while Bark had a trip through the gravel dropping him back to fourth. It only took Bark another three laps to get back to second and as Digby got stuck in traffic through a yellow flag zone the pair were back together. The Clio newcomer had a better run out of Clearways on the final lap and just pipped Digby across the line. The margin was so small between the pair that race control had to revert to a photo for clarification. Meanwhile, Tibbs had passed Humphries behind to take third with Fletcher in fifth. Original content from 750 Motor Club and available here. Jeff Humphries got off the line quickly in the opening K-Tec Racing Clio 182 Series race but went sideways at Redgate allowing Matt Fincham and Patrick Fletcher through. ‚ On the fourth circuit Fincham was caught out by the slippery track and Fletcher took the lead. ‚ The pair were nose-to-tail in the closing stages with Fincham overhauling the former Stock Hatch champion with 50 metres to go. 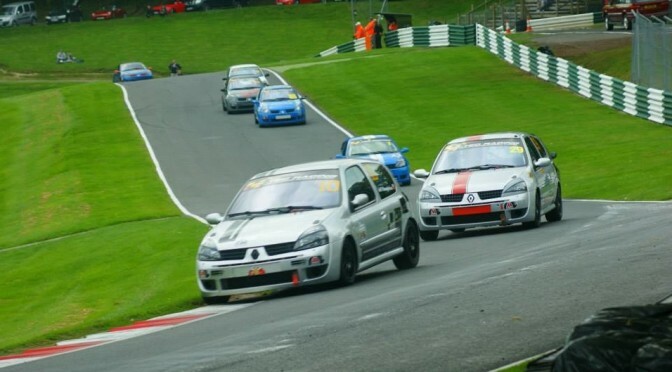 Ed Pead, who won 17 times in the Clio Cup, started from the back and clawed him way up into the top five on the final lap. Humphries led every lap of the second encounter after seeing off various different challenges. ‚ Pete Morgan battled Humphries at the beginning and end of the race but could never pass him. ‚ Matt Digby was able to overhaul Humphries but as soon as he did, he lost his wheel and his Clio fell onto its side. ‚ Patrick Fletcher joined in the battle for the lead and finished third but only 0.5 seconds off of the victory. Original content from 750 Motor Club and available from here. The penultimate meeting of the main season for the 750 Motor Club took place at Cadwell Park.‚ A packed 25 race programme saw some of the best racing that the tight and twisty circuit will see all season. Jeff Humphries returned to winning ways in the first K-Tec Racing Clio 182 Series race which was initially red flagged when Stuart Place went off at Hall Bends.‚ Matt Digby went off at Charlies and Matt Fincham had a broken throttle linkage.‚ Therefore, Patrick Fletcher and Mark Hammersley finished on the podium. Humphries made a slow start in the second battle which helped Fletcher and Martin Ward to beat him. Written by Josh Barrett ¢â‚¬â€œ original content from 750 Motor Club and available from here.